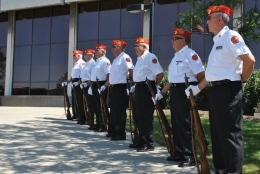 Tri-State Detachment 494 of the Marine Corps League gave a rifle salute to YSU’s fallen soldiers during the annual Reading of the Names ceremony on Wednesday. Photo by Chris Cotelesse/The Jambar. Youngstown State University honored former student Leslie Sabo during the annual Reading of the Names ceremony on Wednesday. The ceremony, which honors YSU employees and students who died while on active military duty, was held at Veterans Plaza on the YSU campus. Sabo attended YSU between September 1966 and March 1969, and he was drafted into the army one month later. Sabo was killed in action on May 10, 1970, during the Vietnam War while saving his fellow soldiers from attack. He was 22. Survivors of the attack filed reports calling for Sabo’s courage to be recognized, but the documentation was lost until 1999. Earlier this month, Sabo posthumously received the Medal of Honor. President Barack Obama presented it to Sabo’s widow, Rose Mary, during a White House ceremony. Sabo is likely the first YSU student to receive the nation’s highest military honor. Jim Olive, program manager of the YSU Office of Veterans Affairs, said he is proud of what Sabo did for the nation and that he is deeply humbled by his story. “He represents the university. We are forever linked to him through our military family and YSU family,” Olive said. David Olekshuk, a master sergeant in the U.S. Air Force Reserves and a network services technician at YSU, said it’s important for Americans to remember fallen soldiers. “It’s an honor to thank them for their service and what they did for us and gave their lives for it,” he said.